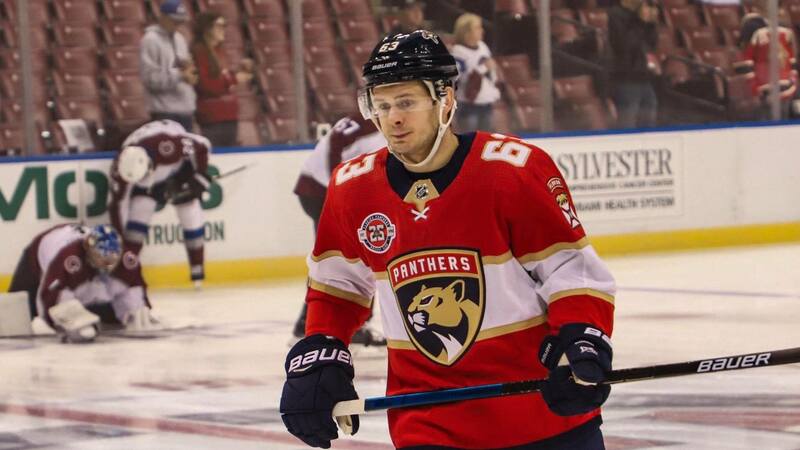 Sunrise, FL – Fresh off of Roberto Luongo’s triumphant return Tuesday night, the Florida Panthers were unable to keep the magic going, falling to the visiting Colorado Avalanche 5-2. The team was coming off an impressive 5-0 shutout win against the Boston Bruins but they found themselves thoroughly outmaneuvered Thursday night at the BB&T Center. Halfway through the first period, the Avalanche struck first as league points leader Mikko Rantanen slipped one past Luongo. With his 12th goal, he extended his point streak to a career-high 10 games. He’s the 10th player to record a double-digit point streak this season. With just over 2 minutes left in the period, Colton Sceviour notched his third goal of the season, energizing both the team and the crowd. He was assisted by Bogdan Kiselevich and Mackenzie Weegar. The goal was disallowed at first but after reviewing the play, the puck did indeed hit the inside of the net just below the crossbar. For a time the Panthers looked like they were at least keeping up with the Avalanche but cracks were beginning to show. During the Cats’ powerplay in the second period, Luongo deflected a shot by Carl Soderberg but it bounced over him and off his back to slide in for the shorthanded goal. The Panthers immediately struck back with the equalizer, fulfilling their powerplay and restoring morale. Jared McCann made a terrific pass across traffic to Aaron Ekblad for the tying goal. With 6:06 remaining in the second, the Avalanche almost found goal number three on their own powerplay. Nathan MacKinnon cranked a laser from a distance that rang off the post, much to the relief of the home crowd. Florida almost found their own trifecta on a few instances where great cross-ice passes were either intercepted by an opposing defender or blocked by the goalie. Their best chance came late in the period when Evgenii “Cat Daddy” Dadonov handled a long pass, leaving him all alone with Colorado goalie Philipp Grubauer. Grubauer denied him, however, with a sweet glove save to keep the game even. Turns out this was the team’s zenith. The Avs broke through in the final period after the Panthers failed to clear the puck out of their own zone. Gabriel Landeskog took over possession and passed it to J.T. Compher who redirected it into the net. Before they could effectively regroup, Colorado scored again less than a minute later to make it 4-2, this time from Carl Soderberg. It was his second goal of the evening helping to cap off an effective period by the Avalanche. Panthers fan, Justin Tipton reacts to the loss. “We didn’t capitalize on our chances, they did and it was a little bit self-inflicted spending too much time on our end,” Coach Bob Boughner. With the loss, the Florida Panthers fall to 11-11-5 (27 points) while the Colorado Avalanche improve to 17-7-5 (39 points). The Panthers wrap up their eight-game homestand with the New York Rangers Saturday. The Panthers tallied a dismal total of 12 giveaways, contributing to their defeat Thursday night. By comparison, Colorado only had three all night. During tonight’s game, the Florida Panthers honored Mark Glass. Glass served 20 years in the United States Air Force from 1978 to 1998. During that span, he served in Germany, Saudi Arabia and the Republic of Korea.